In 2019, the U.K. will become the sixth-biggest games market in the world and the second largest in Europe with revenues of $5.1 billion. Its 37.9 million gamers will continue to grow and push the market above $5.5 billion by 2022. To gain a better understanding of the gamers fueling this lucrative market, we conducted a Custom Consumer Research study together with ACI Worldwide. The study was centered around payment motivations, behavior, and preferences for U.K. gamers. These insights have been made available in a free report which you can download here. In this article, we will explore some of the report’s key findings. An Overview of Paying Gamers in the U.K. 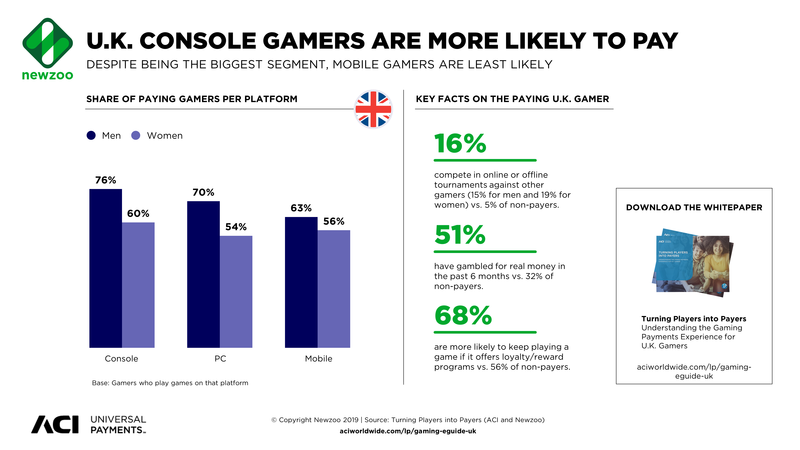 Mobile games are the most popular segment in the U.K. with 94% of gamers playing them versus 85% for PC and console. However, mobile gamers are the least likely to spend money with just half of them doing so. Console games, on the other hand, have a much higher player/payer ratio of 62%. In terms of revenues, its also the largest segment by far and will account for over half of consumer spend in the U.K ($2.8 billion). Zooming in on paying gamers, it’s interesting to note that two-thirds of them are men, most of whom are in the millennial age bracket. Although men are much more likely to spend on Console and PC games, there is no difference across genders when it comes to spending on mobile. Paying gamers are far more likely than non-paying gamers to compete in online or offline tournaments against other gamers and to keep playing a game that offers loyalty/ reward programs. Therefore, adding a competitive element or reward program to your game can help attract and retain more of these valuable players. What Are U.K. Gamers Buying and What Motivates Them to Pay? So, what are U.K. gamers spending their money on? Looking at PC/console gamers, they are most likely to spend their budget on digital and DLC content. Less than half of them spend money on boxed games. This digital transition is driven by younger gamers who are far less likely than older gamers to buy traditional boxed formats. 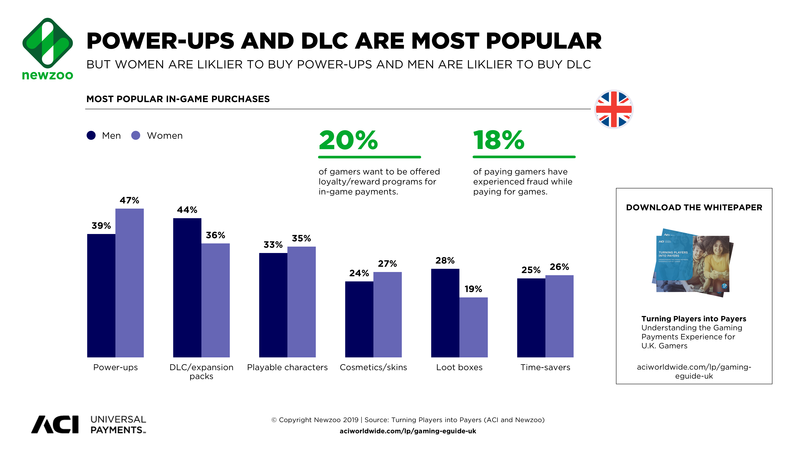 In terms of in-game purchases, power-ups and DLC expansions are the most popular type, for both men and women. Loot boxes are noticeably more popular with men in the U.K.—28% buy them versus 18% of women. For people who do not spend money on games, it’s often because they are satisfied with the free experience. This is a major problem for developers within the mobile market, where most games are free-to-play. Although it will become increasingly important on console and PC, where the model is becoming more common. Of course, the payment experiences themselves also affect gamers’ willingness to pay. This is significant, as 35% of U.K. gamers have had a negative experience when paying online and 18% have experienced fraud while paying for games.